Sony executed a neat Video Pushdown on MSN India home page yesterday for its Xperia Z launch. The video which was shot specially for digital executions with celebrity endorser Katrina Kaif, is another example of how advertisers are finally recognising that celebs should also be used for digital promotions through specially created storyboards that sync with the overall communication and yet bring in a fresh angle to the online media campaign. Check out the execution in the video below. The New Xperia Z is said to bring together the Best of Sony in the phone. The product microsite aggregates campaign assets including the TV commercial, Twitter feeds with the #bestofsony hashtag, behind the scenes videos and images of Katrina Kaif and a Facebook interactive application. The Katrina and You app on Facebook is a predictable idea of getting fans to add their image to a placeholder in a celeb picture, in this case it also has an on-ground layer, which makes gratification more tedious, in my opinion. 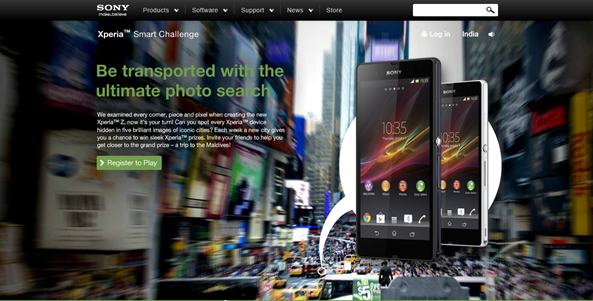 Sony Xperia Smart Challenge is a slick Global execution where participants are asked to look for images of the phone in high quality pictures of iconic cities shared weekly on the site. Sony always impresses with high quality creative executions and this is no different. Cool thank you for the detailed review!